I very much loved playing this game but will not be paying any kind of money to be able to play. To bad they had to go and make the changes that they did, will miss playing but oh well. I love this game but it gets hung up a lot and needs refreshing often. Constantly updating. Seems to have bugs that need working out. I love the concept of this game and the graphics, but it glitches on me a lot. Slows way down and kicks me out. This game is super fun when you’re bored but it freezes up and takes my lives and then expects me to pay for more and I feel like that’s a rip off. If you can work that out I’ll come back and give a higher rating, until then I’m going back to playing Gardenscapes. The game cheats. I’ve had to win levels over and over because it shuts down and doesn’t give you credit. Or it locks up and you have to start over and loose life. Otherwise I’d love it. The graphics, animations, and storyline are well thought out. 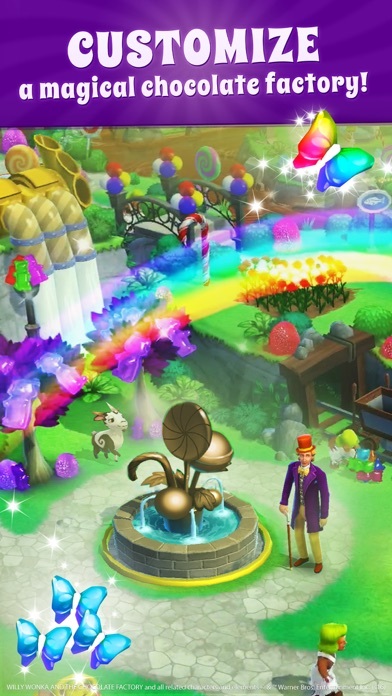 The bright colors and whimsical design make this game really enjoyable. 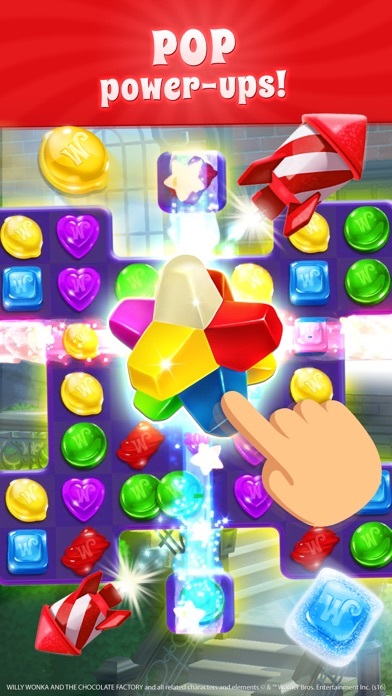 Other matching games tend to increase in difficulty rather quickly, whereas this game gradually becomes more difficult, giving the player the sense of real accomplishments and keeping them coming back for more! 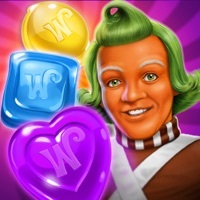 Love this game because I love Willy Wonka and chocolates! Having a lot of fun with this game, love it! I can literally play for 30 minutes then the app crashes, freezes, goes into slo-mo. I will be in the middle of a game and bam! App closes! Lost life! Lost progress! I have uninstalled and reinstalled the app many times. Have verified it is up to date. I have plenty of space on my phone, over 34gb, I have stopped all the motion in the app. Shut off the music, turned off the sounds, and still have this issue. I love the game, but omg! Could you please stop it from crashing???!? I have sent an email to the email address that is in the app and have never received a response from the developers. Guess I will never spend money on this app ever again! WORST APP EVER! This game is fun and addictive but it is a complete rip-off! Everything is so expensive for what you get out of it! I really do love this game. It’s amazing and so fun to play. Yes I rated it a 5,(Stars) but in some of the levels I think there should be more plays. It gets hardener at times. In some levels you get like 24 (for example)moves and in the level it’s so much to try and win with just very few moves. Some you have to hit twice or more with just the moves given. I really think it should have more. Well just my opinion!! This game was fun at first, but it has become Super Glitchy. I play on an up to date newer iPad and the game freezes and shuts down all the time now. The app developers need to do some work on this one. If you don’t want kids crying or adults posting reviews, skip this one. There are plenty more flawlessly designed games out there. So disappointed. I love this game. It is a beautiful game. Very addictive. 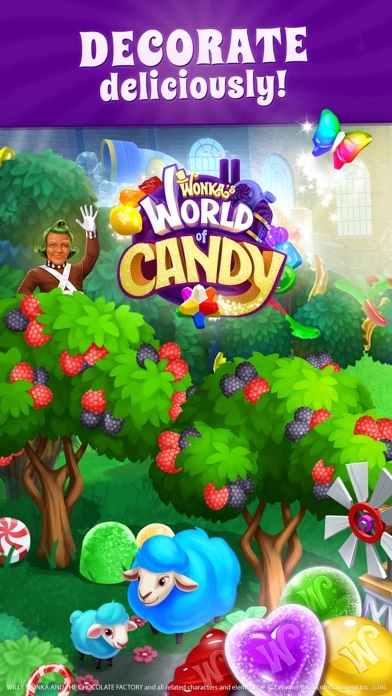 The only cool thing about this is the Wonka connection and the medallion drops of classic Wonka’s characters. What makes this worse than other match-making gameis is the inability to skip over animations. 70% of the game is level-ending animations. Let us skip over that stuff. How about speeding up the tasks? That’ll give us another 10% more playing time. Offline play isn’t seamless either. Weak. Especially since other games have been doing it for years. The game has a hard time dealing with inactivity. It’s ridiculous. No other matching I’ve ever played has issues saving games. Come on, Zynga. It’s not like you’re new to the game scene. 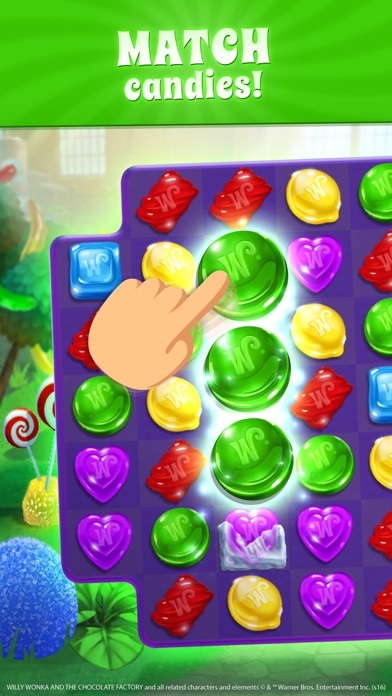 The game is highly addictive and very entertaining but some of the bubbles that blow up don’t really help because they blow up around other candy that’s not necessarily going to help you so it’s a waste. The rockets hits blocked candies but don’t break it completely and sometimes are so random they hit places you don’t need it to hit- there is no control where they are going to hit plus they don’t break anything except the shell the funniest bears are in. When I play I get stuck on one level for weeks not days because like I said they only give 5 hearts to play and little turns to really enjoy the level and move on, besides the rockets are useless as well as the bombs at times the game overall is fun and I do enjoy it but I feel it needs more options and control to where you don’t feel stuck and can move on to continue playing instead of stressing the player out to where it’s not fun anymore! I gave 3 stars because the levels are fun but it won’t win any awards for smooth game play. It seems like it gets more “buggy” with every update. I have tried re downloading it and it doesn’t help. Might be deleting it for good. Fun game at first but now that it is so hard can’t seem to get past the hard levels for weeks and becomes very boring for a person like me and I end up deleting game and moving on to something new. Used to play all the Candy crushes, same thing, gets too boring being on the same level forever and using all of your lives and extra things to try and get through it only to come so close. Nope not dropping any money on it . I have enjoyed the game up to this point. However recently the game keeps freezing, or it’s in slow motion and then freezes, forcing you to close app during your game. The game was fun until they introduced the Valentines candy box. 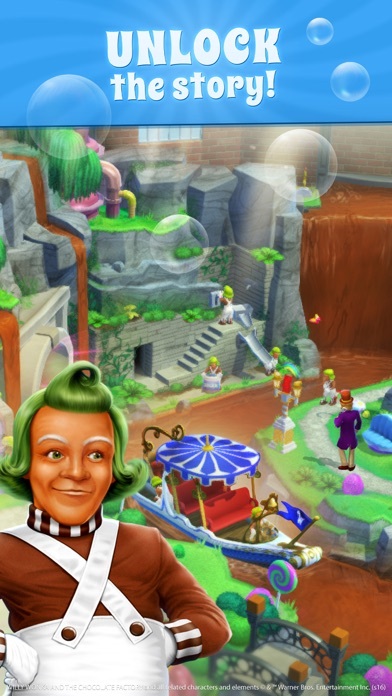 Now once you finish the candy sections you have to wait 8 hours to play again or pay up with your coins. Both times I’ve completed a section I’ve had my one hour of free play lost because of this. And I hate that you HAVE to play this bonus game!! You can’t skip it to play your regular levels. Not a nice update at all! been playing am on lvl 452. i completed the level. and LOW AND BEHOLD I got kicked off the game!! it closed and did NOT register the completion. this has happened alot lately. please fix it because i really enjoy this game otherwise i will uninstall it.